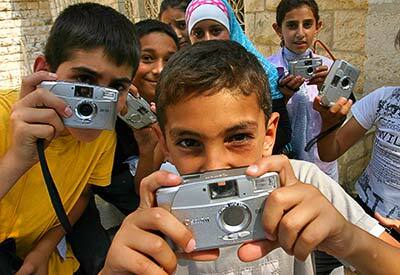 The goal of Kids with Cameras is to empower kids in marginalized communities by teaching the art of photography. 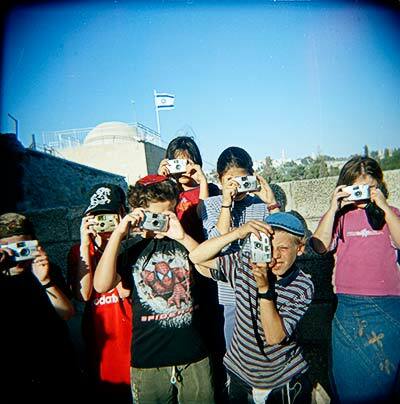 After the success of Born into Brothels, winner of the 2004 Oscar for Best Documentary, where Zana Briski taught photography to the children of prostitutes in India, I was invited by her to choose a country in which I wanted to teach photography to kids. I chose the Palestinian-Israel conflict to bring the cameras and film to both sides of that conflict. The project was funded by a small grant. The project's goal was to make a portrait of Jerusalem from two viewpoints and to create a window into each other's lives. Even though it was impossible to bring both classes together I did however bring the best students from each class together for a meeting so they could both see how each other sees the city that they share, yet where they are strangers to the others culture and worlds. I also used the pictures taken by both sides to open their neighbor's world to all of the students in the classes. After the classes ended in Jerusalem the lessons will continue as I bring the message to other cities via exhibitions that will travel in the US, to wider audience, and encourage each community to make their own Kids with Cameras project, whether it be between Arabs and Jews; Black and White or any other ethnic groups who do not get along. To date the exhibit has been booked in New York, Austin Tx., San Francisco, Oklahoma City, York, PA, Boston, and more. The ultimate goal is to bring the exhibition back to Jerusalem for the kids who shot it and to their families and community. I hope to print a book for them and for the larger community making it available for free to libraries and cultural centers throughout America, Israel, the West Bank and more. In the end I hope to make a summer evening ceremony of coming together, in the very courtyard where I taught the Palestinian Kids in the heart of Jerusalem, inviting all the kids and their families and the Mayor of Jerusalem. Here we will show their work on a huge screen and give out books and awards to the kids. Humus and soft drinks included! Kids With Cameras does not have the budget to print the exhibition or book. I have been personally funding the distribution of the project in the USA. To contribute to these goals please contact Jason Eskenazi/Director of the Jerusalem Project or Rebecca Burton/Director of Kids With Cameras for details. Kids with Cameras is a 501(c)(3) nonprofit organization. Contributions are fully tax-deductible. Tax ID 01-0713018. "Beyond the Wall" - the story behind the project.